It’s been a while since I’ve done a Monday Moth post, so I thought I’d feature one of the prettier specimens in my very limited Lepidoptera collection. 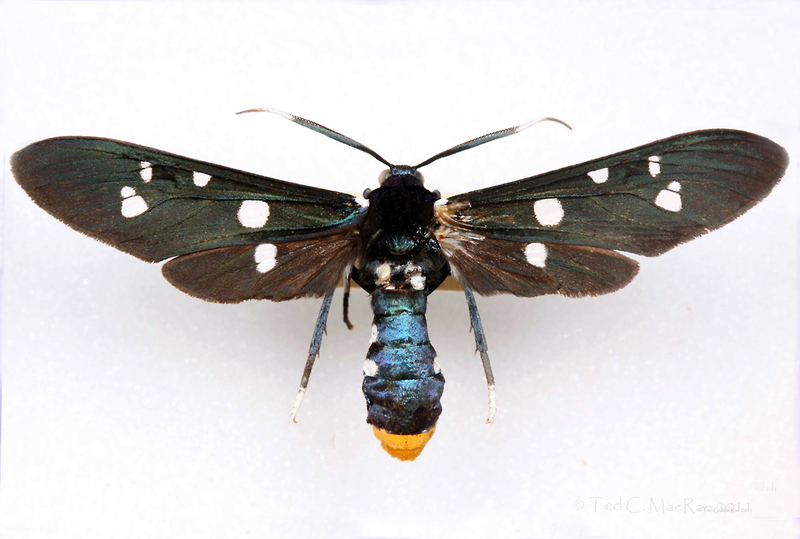 This is Syntomeida epilais (polka-dot wasp moth), one of four species in the genus that occurs in the United States. This particular specimen was collected by me way back in the mid-1980s (I was not quite yet the discriminating beetle collector that I am now) in Everglades National Park (yes, I had a permit). The bright, contrasting coloration obviously screams aposematism (warning coloration), and in fact the tissues of the adult moths of this species are chock-full of several cardiac glycosides sequestered by the larva from its now preferred food plant, oleander (Nerium oleander). Add to it their somewhat wasp-like appearance, and there should be no question to any would-be predator that these moths are a bad idea. Wasp moths are related at the tribal level to another group of wasp-like moths called maidens which are restricted to the Old World. I featured one of these from South Africa last year in the post, Monday Moth – Simple Maiden (Amata simplex). If the cardiac gycosides stored in the tissues of this moth aren’t enough to cause gastric distress, trying to digest the higher taxonomic history of this group surely will. Back in my school days, this moth belonged to the family “Ctenuchidae.” As best I understand it, this group was later subsumed into the tiger moth family “Arctiidae” – itself later subsumed within the borg of all moth families, the Noctuidae. In the most recent classification I’ve found, the arctiine moths have been pulled back out of the Noctuidae and combined with the former “Lymantriidae” (propelled to infamy by the gypsy moth) to form the family Erebidae (Lafontaine and Schmidt 2010). Are you ready to purge yet? It’s still not clear to me whether this latest incarnation represents a consensus monophyletic unit, but it really doesn’t matter – whenever I see wasp moths, maidens, and especially the ctenucha moths that are so common in my area on goldenrod flowers during the fall, “ctenuchid” will still be the first name that comes to my mind. This entry was posted in Arctiidae, Erebidae, Lepidoptera, Noctuidae and tagged entomology, Florida, insects, mimicry, moths, nature, predator avoidance, science, taxonomy, warning coloration. Bookmark the permalink. What a stunner! I’d love to see something like this in the wild – I really love big, off-the-wall-looking moths. I got really excited last fall about an imperial moth that turned up on the outside wall of the dining hall where I work. Thanks for sharing! The royal moths are always a treat to see, but I’m really partial to these small, extremely colorful, wasp-mimicking species just because of the natural history story going on behind the scenes. I just caught one in my garden over my hydrangeas. Ottawa, Canada. It was the first time I had ever seen one of these. I could tell it wasn’t a butterfly as it was buzzing pretty loudly when flying. It was just gorgeous! Hmmm. I managed to move my Police Car Moths (Gnophaela vermiculata) to Erebidae, but still have Ctenucha virginica listed under Ctenuchidae. “Police Car Moths”? What a funny name. I presumed it refers to the black-and-white paint job that most police cars had in times gone by. Yes, I think so and for the flashes of orange around the head in flight looking like a blinking light. Beautiful! For some reason mimics captivate me to no end. Great blog! Have you ever heard of Syntomeida epilais using their wings to communicate a warning? I was just photographing one at the edge of the woods in Central Florida, and when it landed, it continued to vibrate its wings sporadically as it rested. As I was quite close to it (less than 12 inches) I wondered if it was doing it at me, if I was just witnessing a general wasp moth behavior, or if it was communicating with other moths.. Any idea? Thanks! I’ve seen wasps vibrate their wings when not in flight, so maybe that was typical behavior meant to mimic the wasp’s behavior. It could also be done as a way to attract attention and emphasize their warning coloration. Good question. Thank you; it seemed to be a general behavior, but I was pretty close. Thanks for your help!